Choosing the way you will feed your new baby is one of the important decisions you will make in preparing for your infant’s arrival. Doctors agree that for most women breastfeeding is the safest and most healthy choice. It is your right to be informed about the benefits of breastfeeding and have your health care provider and maternal health care facility encourage and support breastfeeding. You have the right to make your own choice about breastfeeding. Whether you choose to breastfeed or not you have the following basic rights regardless of your race, creed, national origin, sexual orientation, gender identity or expression, or source of payment for your health care. Maternal health care facilities have a responsibility to ensure that you understand these rights. They must provide this information clearly for you and must provide an interpreter if necessary. These rights may only be limited in cases where your health or the health of your baby requires it. If any of the following things are not medically right for you or your baby, you should be fully informed of the facts and be consulted. You have the right to have your baby stay with you right after birth whether you deliver vaginally or by cesarean section. You have the right to begin breastfeeding within one hour after birth. You have the right to have someone trained to help you in breastfeeding give you information and help you when you need it. You have the right to receive full information about how you are doing with breastfeeding and get help on how to improve. 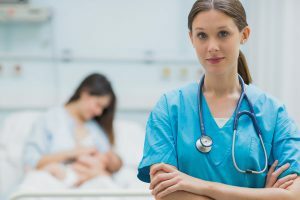 If you, or your baby, are re-hospitalized in a maternal care facility after the initial delivery stay, the hospital will make every effort to continue to support breastfeeding, to provide hospital grade electric pumps and rooming in facilities. You have the right to have help from someone specially trained in breastfeeding support and expressing breast milk if your baby has special needs. You have the right to have a family member or friend receive breast feeding information from a staff member if you request it. You have the right, unless specifically requested by you, and available at the facility, to be discharged from the facility without discharge packs containing infant formula, or formula coupons unless ordered by your baby’s health care provider. You have the right to get information about breastfeeding resources in your community including information on availability of breastfeeding consultants, support groups and breast pumps. You have the right to have the facility give you information to help choose a medical provider for your baby and understand the importance of a follow-up appointment. All the above are your rights. If the maternal health care facility does not honor these rights you can seek help by contacting the New York State Department of Health or by contacting the hospital complaint hotline at 1-800-804-5447 or via email at hospinfo@health.state.ny.us.